Licence Renewal: All students must have their licence renewed by the 1st April each year to be fully covered by the M.S.K.F. insurance policy. To bring all clubs in line with the E.K.G.B. all students must pay an additional £2.00 on top of their annual fees. The £15.00 can be broken down into a monthly sum pro-rata to the students joining date. Paul has to send a monthly return to the E.K.G.B. in reference to all new starters, so can all Sensei’s please provide this information once a new student joins each club. Each new student has to make a commitment to the M.S.K.F. after one month of training to ensure they are covered by the necessary insurance policy. There is a slight change to the enrolment form in reference to the student’s medical background to make it clearer to instructors of any special arrangement that will need to be considered in connection to the individual’s health. The licence procedure will be reviewed this year with the possibility that each club will complete their own paperwork. · All licence renewals to be done by 1st April each year. · £2.00 to be added to student fee’s for the E.K.G.B. · All Sensei’s to complete monthly return of new students. · All new students must join federation after 1 month. M.S.K.F website: Paul will maintain the website from now on ensuring all new events are recorded and general information is available promoting M.S.K.F. Accident Reporting: A reminder to all clubs to use the accident book at each club when necessary. If an entry is made to the book then a copy of the sheet needs to go to Paul so it can be filed in a locked confidential cabinet, to ensure student confidentiality and that we follow the data protection procedures. · Accident Sheets to go to Paul within one week of occurrence. Risk Assessments: Each club will need to carry out a Risk Assessment by the end of the year to stay one step ahead of the probability that the M.S.K.F. will have to produce a document to say that all Dojo’s have been assessed. The Risk Assessments will also include the activities that are conducted in each club for example the ‘sparring’ would need to explain what precautions are in place to limit injury etc. Child Protection: John Tate is the nominated officer for the M.S.K.F. in relation to Child Protection. Most if not all instructors have now had a C.R.B. check done to satisfy the criteria for instructing children. If any other people teach they will need to have a check done, so please forward your nominations to Paul ASAP. We will be looking at compiling a document to give to all parents that includes a statement around this sensitive area to ensure they have total confidence in our federation. · Julie Sheppard – Lea Hall – requires C.R.B. · Ivor Newton – Lea Hall – requires C.R.B. Complaints Procedure: John Tate has offered to do a course on how instructors need to respond to complaints that affect our clubs. This will be another compulsory course for all instructors to ensure we can all report and respond effectively to complaints at every level, so that all members of the M.S.K.F feel that they have a voice and will be recognised. · All Sensei’s to forward nominations ASAP. First Aid: All instructors to have a basic First Aid certificate (M.S.K.F). If anyone has a current certificate, then please check the expiry date as they need to be valid. · All Sensei’s to forward nominations ASAP so that Paul can speak to his First Aid contact. Squad Training: M.S.K.F. is registered with the E.K.G.B. we can look forward to competing in their tournaments. Paul has arranged a referee’s course for all interested members, to improve our understanding of the rules. Paul and Dale will also be investigating the ‘Standard Kata’ that we will have to learn if we wish to enter that section. As it stands at the moment the chosen Kata’s are Jion and Kanku Dai. Once we have done our homework we will be arranging structured Squad Training with a specific class dedicated to developing the Standard Kata’s we need to be within a chance of a trophy!! E.K.G.B. Nationals: Paul has asked for a good level of support when we enter any tournaments as the M.S.K.F. to make sure we go as a strong team. Travel may be put on to accommodate all involved. M.S.K.F. Championship: Ian has made enquiries at the Snowdome in Tamworth as a potential venue for our tournament. All instructors will be asked to encourage their students to take part as we will need to have a certain number of participants to hold the event. 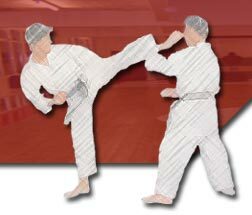 It will be Kata and Kumite for all grades that will have a title attached for example ‘M.S.K.F. Senior Kata Champion’.